Woo Hoo.... 10 hours last night and, boy, did I need them. If that doesn't translate into no knitting, nothing does. I was asleep at 8:00pm. Total exhaustion. The holidays wipe me out. I can't go at that pace. A party every night. Not for me. And it's not over yet. I am looking forward to New Year's Eve with my sister and brother-in-law but after that I want Peace and Quiet for a while!! 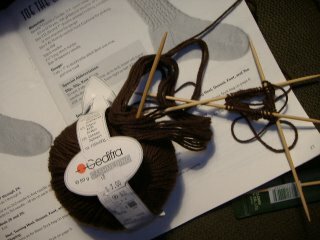 This weekend I hope to finish the brown socks and the big Erin Bag. 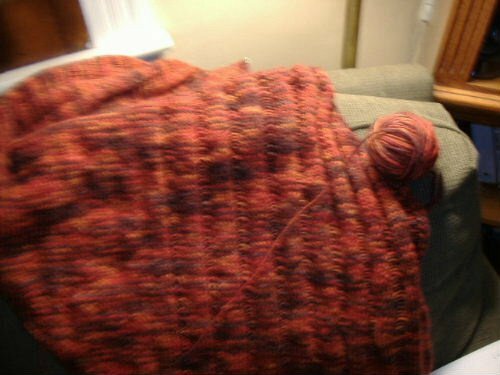 (sans handles, that is) Then I'll work to get Clapotis III finished so I can concentrate on Kepler which I am really enjoying. After that, it's baby, baby, baby for a while. Last night my little grand niece, Meghan, from Colorado, was wearing the aran hat I made for her last winter. It was nice to see it on her. She looked so cute in it. That was a great pattern and fun to knit. I wish I could have gotten a photo of her wearing it to post but, at 2 1/2, she doesn't stay still for long and she's not having much of me anyway. She is my brother's only grandchild and she looks so much like his late wife's family that it's scary. It's sad my sister-in-law never lived to see her. She died of MS at the age of 52. Meghan was born shortly after she died. Since I have so many other things going right now, I'll just make the bigger size once I get it started. My plan is to get the sock yarn for next Christmas's socks (a tradition in my girl's stockings), the yarn for the baby sweater, and maybe the yarn for Kelly's big bulky sweater that she wants. I may save that for Maryland Sheep and Wool. That will be here before we know it. 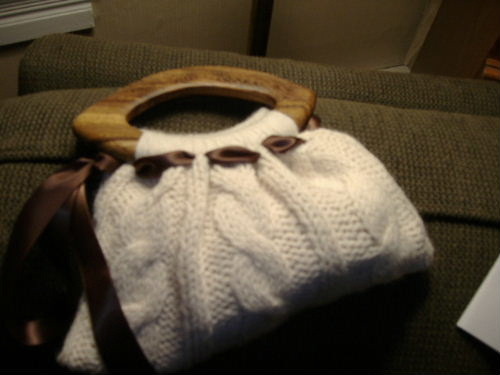 Oh, my daughter told me this morning that when she went out last night, people were going crazy over the little Erin Bag that I made her for Christmas. If you ever need a quick gift, whip one of those up. Everyone seems to love them. Since having the brown socks, Clapotis III, and the large Erin bag currently on the needles just isn't enough, I started Kepler last night. Not to mention the fact that I'm down to crunch time with a baby sweater that I have yet to start. I don't know why I did this. I just had to start it. Some things you just can't explain. This is the hand spun and dyed yarn I purchased from a local spinner. I've really been looking forward to using it. I don't know why I put this pattern off. The cable graph is easy to figure out. It's time consuming because you have to keep looking at it, but it's easy. People (including me) get it into their heads that this kind of stuff is difficult when, really, it isn't at all. 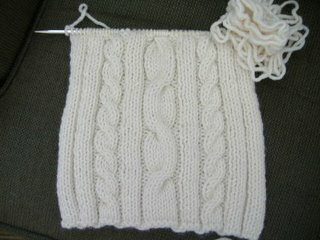 I have much more trouble with lace than I do with cables. It looks a little scary, but looks are deceiving. I added about an inch to the cuff of the second brown sock last night and just got so bored with it I had to put it down. Once I turn the heel and get to the stockinette part, I'm ok. I really don't like that cuff pattern on those socks. I had to go buy more yarn for the big Erin bag yesterday and I need to get it outside in the light to make sure the colors match. 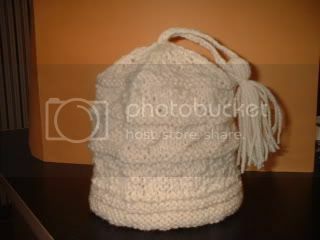 It is Wool Ease Chunky off white. That should all be the same I think. Every time I think about doing it, it's dark. And you can't go by artificial light with these things. I am anxious to get that finished and get it off to London. Finding handles for it is going to be the biggest challenge. Congrats to Natasha for the new website.. it's great. Her yarns are awesome. There is no other word to describe them. I hope everyone had a great Christmas. We did. I'm completely exhausted so I guess that's a sign that it was good. I don't know.... but I feel like I need a vacation! I was glad to get back to work! Eating and drinking and socializing must be hard work. I finished a sock yesterday. I'm not crazy about the pattern but it feels great. I started this sock on the spur of the moment instead of really thinking about a better pattern. It's ok. Just ok. 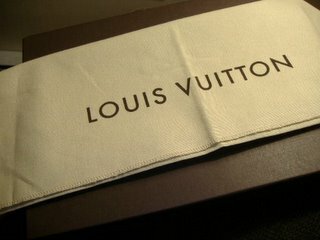 Here is Catie's Erin Bag. I couldn't show it before because I didn't want her to know I made it and she does read the blog. It turned out really cute and I love the oval handles. (from the rip off company, of course) She really liked it. 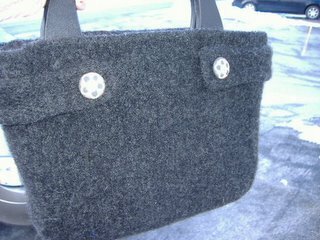 My older daughter went nuts over the charcoal gray felted bag too. She was surprised. She thought I had forgotten all about it. It's a new version of the same camera. It's lighter, it's all automatic (unless you want it to be manual) and it's really easy to use. Having said all that, I just couldn't believe that the picture quality would be as good as my old camera which was perfection. I was wrong. I had the first film developed yesterday and they are every bit as good as the old camera's photos. So Mom is a happy camper once again. With a new grandchild coming, you have to have a good camera! Merry Christmas!!! That's what we celebrate and if you're celebrating something else, enjoy! 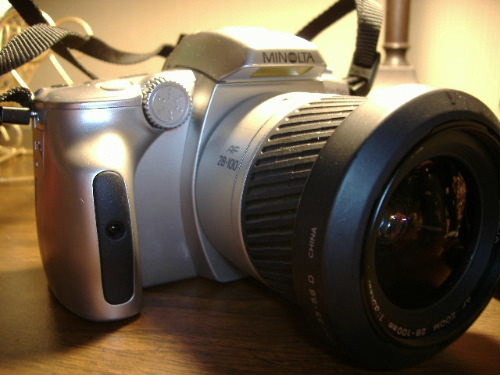 Since my home computer doesn't like my digital camera software, I'll be taking a blogging break until next Tuesday. Enjoy your family. Enjoy the food. Take lots of photos so you can always treasure the memories. I got nuttin honey. Nada. I did work on the brown socks last night but that's kind of boring. I decided to forge ahead with them even though they are probably going to be big, droopy, brown yarn boats. I definitely have the yarn bug again. Only 12 more days until the LYS New Years Day sale. I want to get the bulky yarn for my daughter' s sweater and some new sock yarn. I want to try Grumperina's Jaywalker Socks. I still need some pink yarn for the baby sweater too. I need to get cracking on that! I decided not to use the pastel Opal sock yarn for the baby sweater. I think it would be adorable but not "sturdy" enough. I think I want to knit a more substantial sweater for this climate. The one pattern that I found that I love starts out in a 2T size and that's too big. So I'll keep looking. I'm thinking Aran. You know how I get. 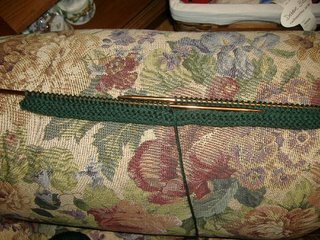 Since I didn't have anything to do over the weekend (HA HA) I started another little purse but this one won't be so little. I've decided to call these little bags "Erin" bags since the first one I made, I made for my niece, Erin. She said her friend wanted one... only bigger than hers. 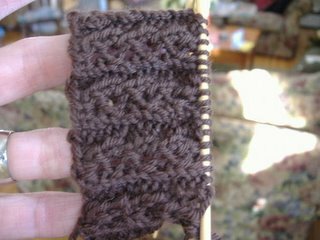 This one is Wool-Ease Chunky (or bulky... whatever) on size 10 needles. I had been trying to come up with a pattern that would be good for this size bag and, get this.... I was sitting at work on Friday, just happened to look down at the sweater I had on (from J.C. Penney's), and the pattern was right in front of my eyes. So I went with it. It's cute. One of these days I'm going to make one for myself! I am having trouble finding the right wooden handles for this though. The 4 1/2 inch ones I got before are too small and I can't seem to find larger round ones that are good quality. If I wanted cheap plastic I'd be in great shape. I also made some progress on the brown socks. I'm embarassed to admit this, but out of all the socks I've made, and I've made dozens of pairs, this is the first time I made them with a design in the cuff other than a plain ribbing and basic stockinette stitch. I just never wanted to complicate it. 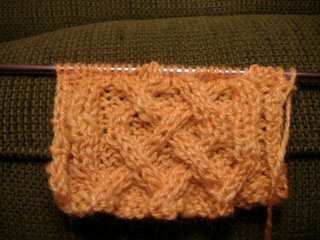 I'm liking the process but I can tell that this yarn isn't what I should be using. Yes, I needed that elastic stuff. I need to decide whether to rip or keep on going. I'm not sure at this point. The list of things I need to get done today is about a mile long so I better get hoppin. Have a great Monday! I worked on Clapotis III after I finished the socks. I still have all of section 4 and 5 to do yet. As much as I love this pattern (and I really really do), I think this will be my last Clapotis for a while. I am finally getting tired of it. And never again with a mohair blend. Duh. That was stupid! It's only 20% mohair but those darn little fibers really tangle. It's going to be beautiful though and it's going to look fabulous with my camel coat. And because I think there should be socks on needles at all times, I started these last night too. I need some plain black and brown warm socks to wear to work. I wear these opaque trouser socks all the time and they do nothing to help with the cold feet. All of my hand knit socks are a little too flashy for work so I'm going to attempt to remedy that little problem. I don't know how this yarn will do with whole "memory" thing that is so important with socks but we'll see. I have a feeling it's not going to do very well. It's a cashmerino blend. It feels wonderful but the first time I wear them I'll probably end up with yarn "boats" at the end of the day. Catie will be home from school tomorrow. I'm hoping her arrival will help me get more into the Christmas spirit. I just haven't been motivated at all to do the things I need to do yet. I have my family for Christmas Eve... about 28 people.... so getting my house in order is the number one priority. I keep thinking about everything that needs done, but instead of doing it, I sit and... well....knit. Ok, ok, I know. It's not real attractive. It would definitely be better if I could have found a NEW tube sock but I grabbed what I could find on my way out the door (and it IS clean). I may have mentioned that my office is built on a slab and my feet get cold to the point of having my toes go numb. I must have poor circulation because no one else seems to be complaining. Anyhow, I read online that you can make footwarmers with whole rice and a tube sock. 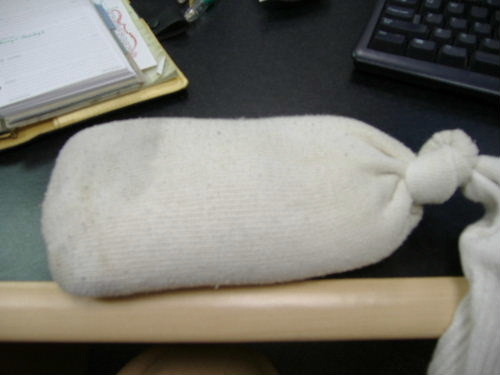 Just fill up the sock with rice, tie the end, and pop it in the microwave for a minute. You can't believe how well this works. I did it and the thing stays toasty warm for over an hour. I feel like my feet are resting on hot sand at the beach. It's wonderful! So have one ready for when you come in from shoveling this evening folks! I really didn't need to add new obsessions to already existing obsessions, but I'll be thinking about these patterns for a while. 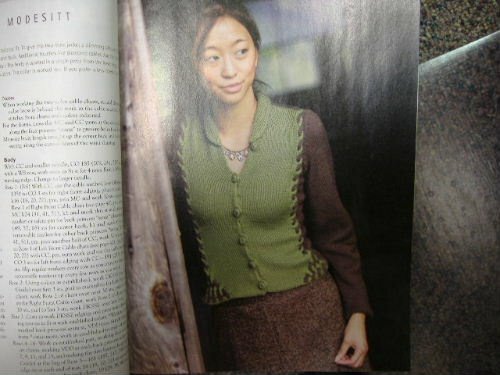 Oh, and if that green skirt doesn't end up here.....You Knit What??..... I'm going to be disappointed. We had our family cookie exchange party last night. I opted out of the cookie part of it a few years ago (way too much stress) but I still go to the party. I had on my old winter jacket (I usually always wear a dress coat because I normally always go everywhere from work) and a terrible scarf that I just threw on because it matches my old jacket. Anyhow, the scarf is a plain garter stitch scarf knit out of two strands of cascade 220 held together without fringe that came into being because I was stash busting last year and just wanted to use it up. To make a long story short, people went nuts over that plain, stupid scarf. I left there with all kinds of relatives begging me for knitting lessons.... including my nephew! I can't imagine what might have happened if I had actually worn a NICE scarf! ...and way too small. These things are teeny tiny. 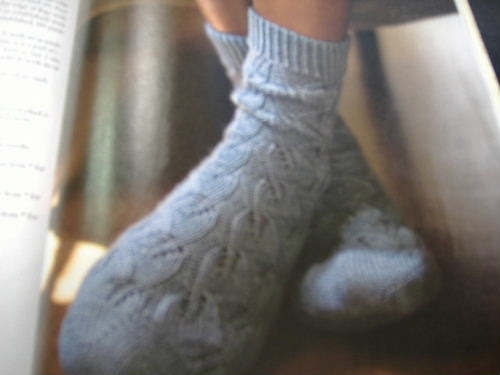 No baby born is May is going to be wearing wool socks any time soon. And these will only fit a newborn. So off they go to London to baby Georgio due in February! It was a cute idea to tuck them down into my daughter's Christmas socks since they match but her baby would never wear them. No sense wasting them. 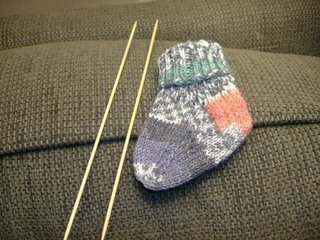 Blogger won't let me drag and paste the pattern for some reason but you can google it by searching "Infant Socks" and "Judy Ellis". That should bring it up. I realized the other day that I am putting off starting Kepler like I put off housework. Subconsciously, I think I'm afraid of that braid. I don't know what's the matter with me. That is my favorite kind of knitting. Once I get started I know I can figure it out, and yet I just keep putting it off because it looks complicated. I'm such a chicken! And I mean little! 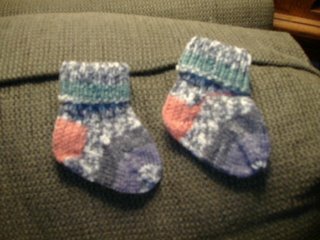 I found a cute infant sock pattern online yesterday and I thought it might be fun to put these little socks inside the ones I made for my daughter. It will be cute little surprise and I certainly had enough yarn left over. These are knit on size 1 dpn's. I've never used size 1's before.... wow.. skinny! 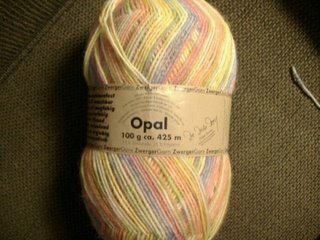 Here is the new Opal "petticoat" yarn I got over the the weekend. I was asked if I wanted to be on the waiting list for this since it is in such demand. I said......sure, why not. While it is beautiful, the pastel thing really isn't me. It's going to be something awesome for the baby though... I just don't know what yet. Any suggestions??? 6. I come from a very quiet and reserved family. No one tells anyone anything. It's weird. 7. I'd rather travel alone and do my own thing most of the time. I don't, but I'd like to. 10. I used to play golf. I don't anymore. 7. Go horseback riding... why does that seem like such an impossible thing? 1. Knowing that I raised 3 good kids. 2. My husband bringing me a cup of coffee every morning when he wakes me. 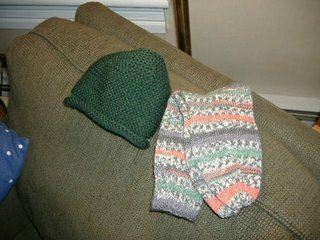 I finished Opal socks and baby hat last night. (hey, the socks actually MATCH... that's a first) Look at that stupid hat. The pattern is from a Debbie Bliss book and at the end of the pattern, at the decreases, the instructions just vanish into thin air. It says something like "continue decreases in this manner on alternate rows" or something like that and it makes no sense whatsoever. So I did just that. I continued doing what I was doing and there is a now a "point" at the top of the hat that isnt' supposed to be there. There are 3 normal rows in between the decrease rows. Obviously I was not supposed to do that at the end but did it SAY that??? No, it did not. Grrrr. I should have ripped it out but I just kept going. I lose my place when I rip. Anyhow, this hat is going to charity. Some baby somewhere with a pointy head is going to have a lovely new cashmere (blend) hat. Notice that I lost my floral background for the photos. That's because my helpful husband rearranged the furniture and now the chair is under the light and not the loveseat. It makes for a pretty dull background. Don't you think? I don't know if I can live with this. I think I have to come up with plan B. I don't know what it's going to be though because I need that light for the photos. And I can't move the light. So my Christmas knitting is finished. I'm sure I could still squeeze something in for someone but I think it's time to finish Clapotis III for myself. 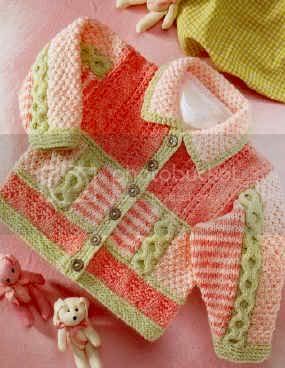 Then the girly baby sweater for my neice. Then Kepler which I have been dying to start. I'm still considering lining the alpaca scarf with flannel (Natasha's great suggestion) and giving it to my boss. My only problem at this point is finding someone to do that. I don't sew. And you really hate to ask someone to do something like that this close to Christmas. I don't know. I guess I could just give it to him itchy! I had a client a few years back who told me that his wife got so stressed out over the holidays that they began the tradition of going on a two week cruise over Christmas. I don't know if I could do that (well, yes, I DO know that I couldn't do that) but it does sound enticing. 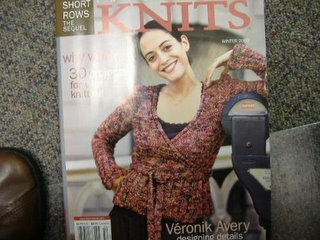 No knitting news. I worked on the Christmas decoration chaos at my house last night and got about half way through it. So much work for such a short amount of time. I know... just call me Scrooge. If it weren't for the kids I'd stick a little pre-decorated tree on a desk and call it a day. My son just shakes his head when I say that. Mom is definitely losing it. Our knitting guild christmas cookie exchange last night was very nice. 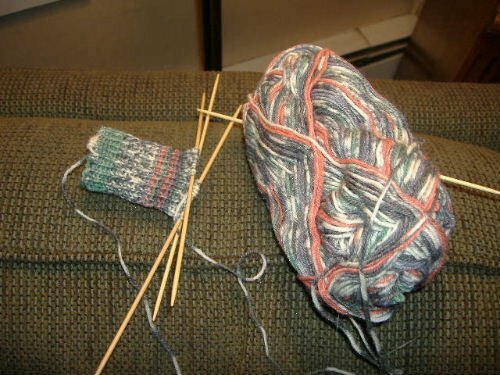 I've come to the conclusion that knitters are just nice people. We had a good time... and, yes, I ate too much as predicted. One of the girls brought her drop spindle and I was watching her spin yarn. She told me that if I bring mine to the next meeting that she will help get me started. She made it look so easy... but I know that it takes time to get the hang of it. I'll leave you with a New York photo taken on Saturday. This is Cartier on 5th Ave. 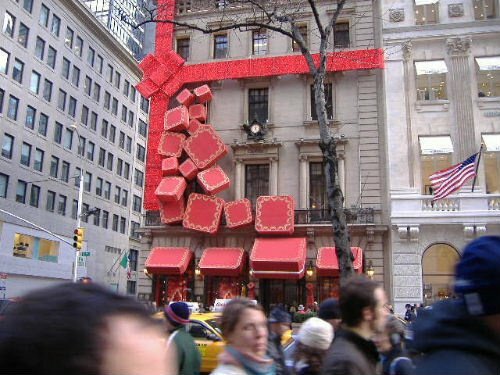 I'm sure all of my Christmas gifts are going to come from there.... at least the one's that don't come from Tiffany's. Um... yeah. Right. That might happen. It's already started. FOOD OVERKILL. This is the time of year when food starts pouring into the office, friends invite you to dinner, holiday parties are everywhere, etc. My problem is that I have no willpower. None. Last night I baked cookies for my Knitter's Guild cookie exchange and I ate a bunch of them right off the cookie sheet and then a few for breakfast this morning. I get totally out of control this time of year. Our guild is having a party tonight so I guess I'll just pig out there too. Ugh! I'm really out of it today because I took two Tylenol PM last night to help me sleep. That stuff works like a dream (no pun intended) but it makes for a groggy morning. But I get so stressed out this time of year that I have no choice if I want to get any sleep. No knitting to report. My husband took the day off yesterday and brought down all the Christmas decorations and they are scattered everywhere waiting to be put where they belong so it could be a while until I'm able to sit and knit. He also rearranged the furniture and now my little knitting corner on our loveseat is in a totally new location without my usual proximity to the televison or the light. He moved a chair to that location and I just don't think a chair there is going to cut it for me. I cannot spread all my stuff out on a chair. (MEN!) 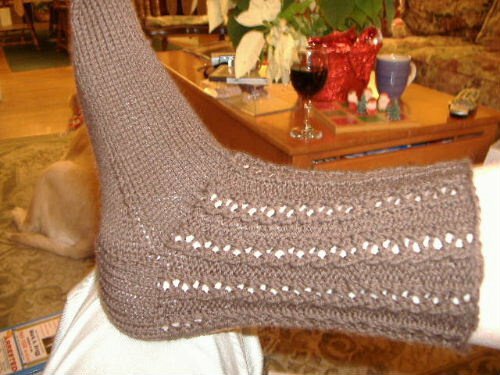 I have to finish Kelly's socks. Then I'm finished with Christmas knitting. I wanted to get a few other gifts done but that isn't going to happen. You can only do what you can do. Well, I better run. My goal for today is to stay awake and stop stuffing food in my mouth. Wish me luck. I love the entrelac scarf.....love it, love it, love it. But there isn't too much else there that excites me. There are some nice things , and cute things, but probably nothing I feel like I have to knit. The little cat featured on the homepage is adorable. 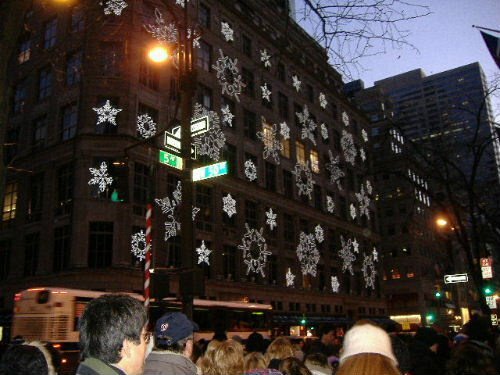 They have snowflakes for their Christmas decoration. 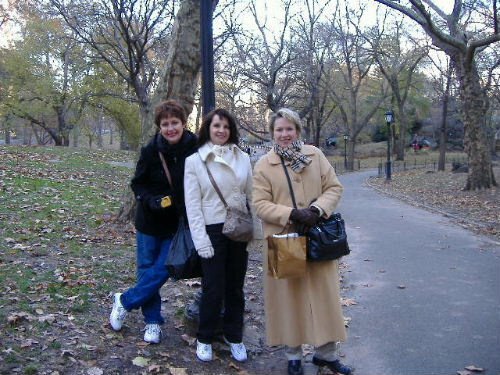 This is us in Central Park... notice my Godiva Chocolate shopping bag. Do I have my priorities straight or what??? I just created the longest post with tons of photos ... it took me 45 minutes. I hit publish, and I got an error message that said "the blog you are looking for is not found." But, sorry, I'm not going through that again. New york was fun. There were photos. There was content. 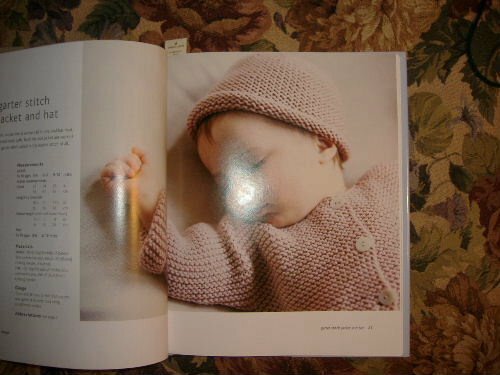 I decided I needed some mindless knitting for the bus trip to NYC tomorrow and I decided on this baby hat from a Debbie Bliss book that I have. I'll send it to baby Georgio (my sister, who is grandma, already has his name embroidered on a Christmas stocking so I guess it's going to stick) who will be born in London in February. 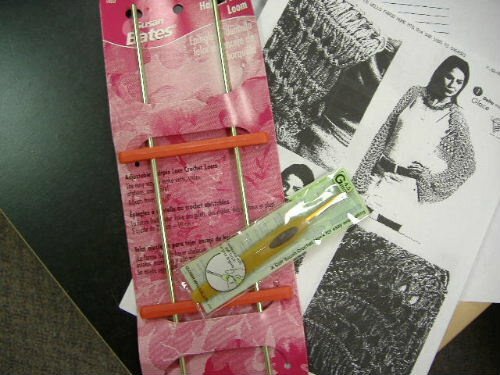 I had some left over Debbie Bliss Cashmerino Aran from the scarf I made and I thought this would be a good stash busting project. To me, it looks a little big for a newborn but we'll see. It's super soft... lovely yarn. I love working with it. So the bus trip leaves out of State College at 5:00am which means I will have to get up around 3:00am to get ready and make it there on time. Lord! I might as well not go to bed tonight! I know that I'm going to be asking myself, "Why did I say I'd do this???" I've been there and done this so many times before that I'm not really sure why I AM doing it! I decided that once I am completely finished with Christmas projects, I'm going to do another baby sweater and then do a lot of little hats and socks to use up some left over yarn before starting Kepler. There are enough babies coming in this family to benefit from a little stash busting... that's for sure. I really need to get rid of all this yarn. It's taking over my house. 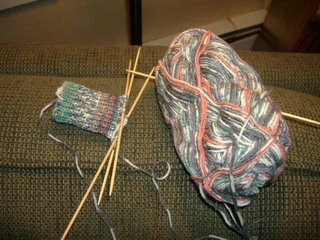 And I love knitting socks for myself from left over yarn. Playing with the different colors and striping is a lot of fun. My feet are freezing in the office again. Buildings built on a slab are murder on the feet in the winter. If I lived in a house built on a slab I'd just have to die! I sell a lot of them and I think....never! No way! I don't know how people can stand it. I think I've rambled on enough for one day. Happy Weekend! I was looking in my bin of FO's last night wondering what to give to who for Christmas when I came across the alpaca scarf that was originally intended for my son-in-law. (see it in my September archives) I don't know what to do with it. That is the itchiest thing that I've ever put next to my skin. And if I wouldn't wear it then I'm certainly not gifting it. I guess it would be a good accessory with a black coat as long as you didn't try to actually use it to keep your neck warm. I have to say that is the most disappointing FO that I made this year. And everything you read about Alpacas on the various websites says, "Softer and not itchy like wool". Softer, yes, but heck, give me wool around my neck any day! I'm just wondering if that is normal for Alpaca or did I get a weird batch? There are some cute things in here. 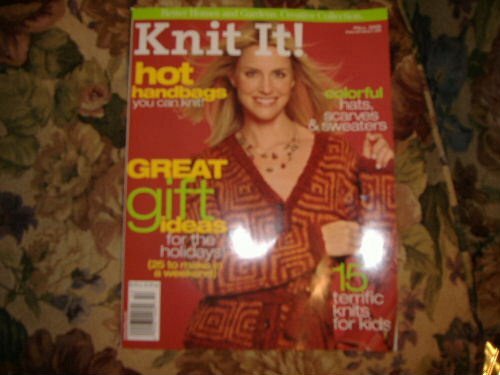 It is obviously a collaboration of Better Homes and Gardens magazine with Lion Brand yarns because most of the patterns call for that yarn. Projects of interest to me in here are a toddler's hat and mittens (very cute made with bright colors of Lion Brand Homespun), a big felted bag that called for Lion Brand Landscapes, and a really cute child's rainbow cardigan that calls for Lion Brand Jiffy Thick and Quick yarn. 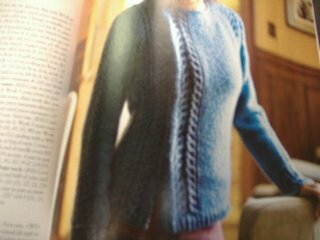 There is also a man's aran sweater that calls for really bulky yarn that I like. I would knit it in a small for me.... my husband would never wear anything that heavy. Also, there are some cute baby things knit in chenille. I can't stand the feel of chenille so I would never go there but they are cute. 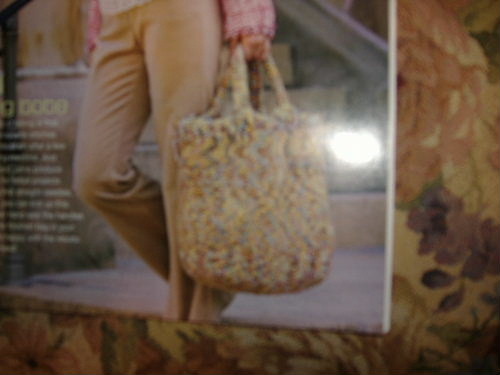 The real reason I did purchase the magazine, however, was for the felted bag pattern. It looked like it would be a great diaper bag for my daughter. But, it calls for 13 skeins of Lion Brand Landscapes yarn and I think a $90.00 diaper bag is out of the question. If I'm spending that kind of money on the baby it's going to be for something more important than yarn! And, come to think of it, how does a 50% wool/50% acrylic yarn felt anyhow? Probably not very well. It really is nice though.